Today, TaggTo officially launched their iOS social commerce application. TaggTo takes a unique approach to social commerce by combining customer reviews, customer service, and product discovery. This is all done through the use of a streaming news feed that has a user interface very much like that of Instagram. What stands out about TaggTo is the way in which the application makes use of users’ cameras. In what provides a very interesting opportunity for eCommerce stores and brands alike, TaggTo incorporates – and really relies on – a filter-rich picture editor. The application combines these user generated pictures and reviews with official content and info for a more complete view of the product. TaggTo allows brands and eCommerce stores to leverage their customers and brand/product champions in several easy ways. Firstly, through the application itself. All content items appearing in the application – product photos and reviews – are shoppable, with TaggTo linking to the original product or sale page. 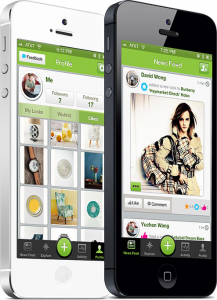 TaggTo CEO Yuchen Wang told us that they are considering adding in-app purchasing functionality down the road. Brands and eCommerce stores can further leverage the service by creating an account on TaggTo and providing their data feed to ensure all of their offerings appear within the application. Once a brand or eCommerce has an account, TaggTo provides rich analytics and allows for in-app promotions. Brands and eCommerce stores can incorporate TaggTo’s user generated content into their website through their API. Beyond product reviews and pictures, TaggTo also provides users with many additional benefits. The most appealing of these additional functions is the ability to be notified when a product goes on sale – feature to be rolling out soon. By following products, brands, and other users on TaggTo, the application offers users relevant product recommendations from the community. While there has been a proliferation of social commerce applications and platforms as of late, TaggTo’s approach is novel. The application is more than just an avenue through which to sell products; it is a community, providing value to both users and brands/stores. Users are better informed about products and receive personalized, relevant product recommendations. At the same time, brands and stores are empowered to interact with the community and reward brand champions and advocates. TaggTo has tons of potential, and it will be interesting to follow the development of the application as it matures. Download the Free iOS Application on iTunes and check out the TaggTo Website.